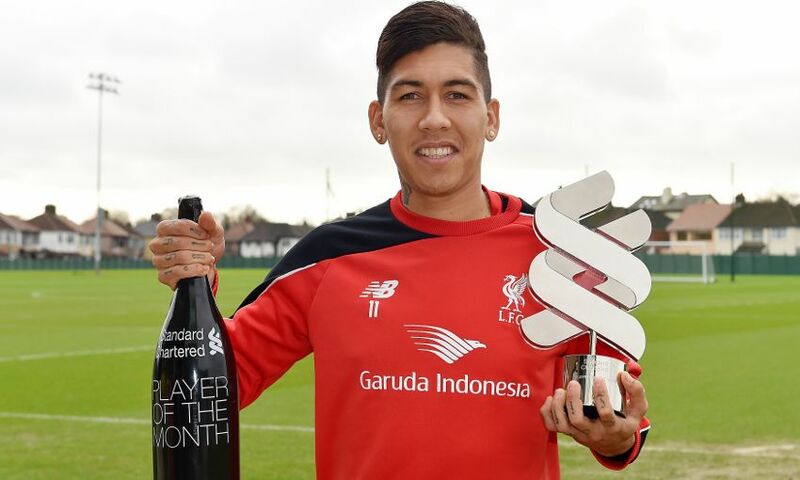 Roberto Firmino has claimed his first Standard Chartered Player of the Month award at Liverpool after fans voted the Brazilian as the team's top performer in January. The No.11 made six appearances and showed his goalscoring potential with a clinical brace against Arsenal at Anfield, pouncing on a rebound for his first and then whipping a stunning finish into the top corner during an action-packed 3-3 draw. He followed that up 10 days later with another well-taken brace and an assist to help the Reds come out on top in the sensational nine-goal thriller with Norwich City at Carrow Road. Firmino received 62 per cent of more than 50,000 votes cast by supporters on Twitter to decide the winner, with Joe Allen the runner-up, Adam Lallana third and Lucas Leiva fourth. Upon collecting the accolade at Melwood this afternoon, the smiling forward swapped his native language for English to say "thank you very much" to the fans who voted.